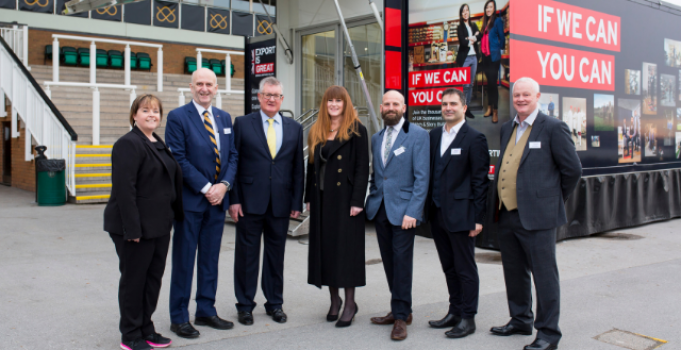 The achievements of the Stoke-on-Trent and Staffordshire Local Enterprise Partnership in bringing jobs and growth to the area have been showcased at the LEP’s annual conference. More than 200 representatives from local businesses and organisations attended the conference at Uttoxeter Racecourse on Friday January 18 to hear a keynote address from Small Business Minister Kelly Tolhurst MP, plus a range of speakers from leading businesses. The Minister praised the work of the LEP and told the conference that the Government was committed to boosting economic growth across the whole nation and building a Britain fit for the future. Kelly Tolhurst commented: “As the Stoke-on-Trent and Staffordshire LEP’s Ministerial growth champion, it is a great pleasure to speak at the annual conference and open the new Park Hall Business Village. “Through our modern Industrial Strategy we are investing in the skills, industries and infrastructure of the future and LEPs have an essential role in ensuring this translates to more jobs and growth at a local level. In SSLEP this has included support for projects such as improving the Stafford Western Access Route and developing the UK’s first low-carbon heat network system. LEP chairman David Frost CBE said he was delighted to welcome the Minister and hear her views. “We are delighted that Kelly Tolhurst has found the time in her very busy schedule to speak at our conference and to meet some of the best of our region’s successful businesses. The LEP’s conference showcased Stoke-on-Trent and Staffordshire’s successes in project delivery, jobs and growth, which has included opening up key employment sites for development and major investment in skills and training. The LEP has already beaten its 2011 target of creating 50,000 new jobs by 2021. LEP vice chairman Alun Rogers, founder of Stafford-based IT firm risual, who spoke about the Local Industrial Strategy and shaping the economy of the future. Steve Wileman, founder of Tamworth-based Enlighten, winner of Staffordshire Chambers’ Best Digital Business 2018 and Most Promising Start-up 2016, who gave a presentation on their experience starting a business in Staffordshire. Carol Shanahan, MD of Synectics Solutions, Staffordshire Business of the Year 2017, who spoke about business and community. Tony Millar, director of Staffordshire Moorlands firm Great Grounds, which combines landscaping and design work with educational programmes for schoolchildren. The conference was introduced by LEP chairman David Frost, and there were also presentations from Cllr Philip Atkins, leader of Staffordshire County Council and Cllr Abi Brown, deputy leader of Stoke-on-Trent City Council. “The LEP continues to build on its solid foundation of successful project delivery throughout the area with exciting ongoing plans to promote growth and help our economy and communities to thrive,” David Frost commented. “Recent achievements include the completion of major infrastructure works opening up sites including Four Ashes, South Staffordshire, and Branston Locks, Burton-upon-Trent, for business use, plus an award-winning scheme protecting Rugeley town centre from flooding and paving the way for new jobs and homes. “We are also seeing development gathering pace at our Ceramic Valley Enterprise Zone in Stoke-on-Trent and North Staffordshire, and work starting on the pioneering Smart Energy Network at Keele. Picture caption: Small Business Minister Kelly Tolhurst (centre) is pictured with (from left) Stoke-on-Trent City Council deputy leader Cllr Abi Brown, Staffordshire County Council leader Cllr Philip Atkins, SSLEP chairman David Frost, SSLEP vice chairman Alun Rogers, Steve Wileman, co-founder of Tamworth-based Enlighten, and Tony Millar, founder of Dilhorne-based Great Grounds.